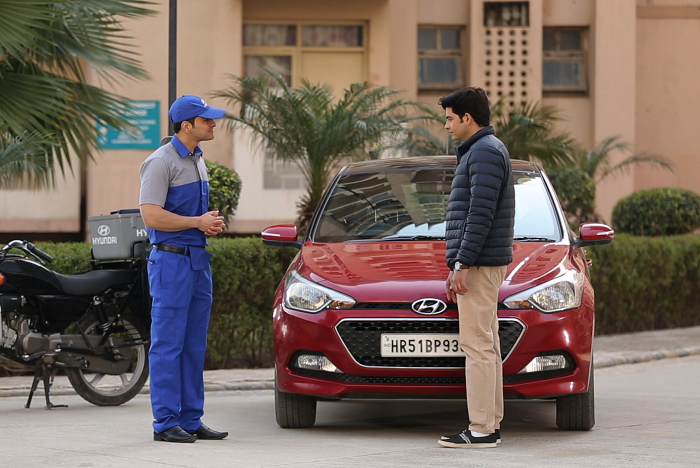 13 FEB 2019, New Delhi, Delhi, IndiaHyundai Motor India Ltd, the country’s second largest car manufacturer and largest exporter since inception, has successfully strengthened the ‘Door-Step Advantage’ initiative to more than 475 locations across India using over 500 two-wheelers. Hyundai Motor India Ltd, the country’s second largest car manufacturer and largest exporter since inception, has successfully strengthened the ‘Door-Step Advantage’ initiative to more than 475 locations across India using over 500 two-wheelers. To realize Hyundai’s after-sales service motto of ‘Right Here, Right Care’ – this initiative will further assure customer Happy Life by providing best customer support. ‘Door-Step Advantage’ emphasizes on providing customer support for minor repairs, Dry Wash and Car Detailing (such as Exterior and Interior beautifications) at the location of their choice. Customers can also avail of this convenience through online booking & payment. Such customer-centric approach has helped Hyundai Motor India to retain J D Power CSI No. 1 Rank for two consecutive years, 2017 and 2018, amongst Mass Market Brands.